Putting a silver coin into the Christmas pudding is a long standing tradition amongst British families. The coin is thought to bring good luck and wealth for the following year to the person who finds it. That luck would begin with not choking on the coin while enjoying the dessert. 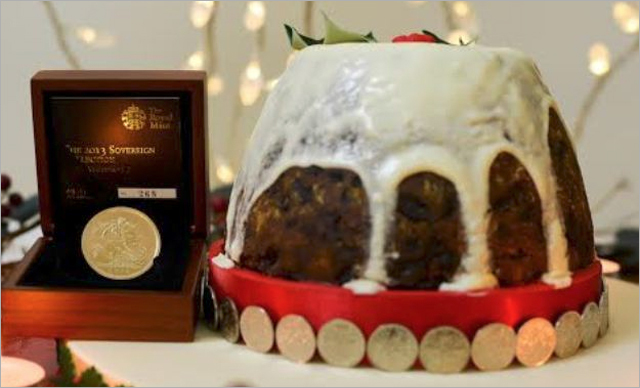 This year the British Royal Mint has commissioned actress, writer and now cake-entrepreneur Jane Asher (yes, the same Jane Asher who was engaged to Paul McCartney in the 1960s) to create an extravagant and regal Christmas pudding, based on a 200 year old secret family recipe containing festive spices, dried fruits and blanched almonds. The most expensive ingredient in the dessert is 35 rare silver and coins, including five 2013 uncirculated £5 Sovereign Gold coins each worth £1,900 and thirty Silver Sixpences.